That story is still developing and it is not mine to tell at the moment, but it leaves me with a new challenge. How do I provide support from a distance with all of the other responsibilities on my shoulders? How do I provide moral support and access to her only granddaughter when she is unable to visit on her own? Flying is one solution. When Saturday arrived conveniently wrapped in the package of a stable high pressure airmass, a day trip to Michigan with The Bear became a must. For this trip, I took advantage of the capability in ForeFlight to activate and close VFR flight plans with the push of a (virtual) button on my iPhone. This method is far superior to the "clunky radio call over an RCO" technique from the old days. The route was familiar and comfortable: cross the Niagara River into Canadian airspace, make a quick journey over a sparsely populated agrarian Ontario landscape, cross the St Clair River into Michigan, and arrive at Oakland County International Airport. Just another jaunt to grandmother's house. There was a headwind to battle and it stretched our outbound flight to three hours. I always enjoy trips with my diminutive (though steadily becoming less so) copilot. My daughter read a book and listened to music from her iPad en route. She declared that the Broadway version of the Lion King made for good flying music and I caught her humming "Morning Report" frequently enough throughout the day that I started humming it, too. After a long week of hard work, the flight provided me with a much needed mental respite. We floated serenely over Ontario, calm air fostering hands-off flight and lack of radio chatter allowing me to enjoy some quiet music. A confluence of waterways below caught my eye; the aqueduct that carries the Welland Canal over the Welland River. I was intrigued by the notion of an aqueduct supporting mammoth Great Lakes freighters as they crossed the land between Lakes Erie and Ontario. I imagined myself in a kayak on the river, looking up at a massive laker crossing high above on a water-filled overpass. I enjoyed these details of the surface below. They provided welcome distraction to a restless mind. Crossing the St Clair River, I photographed a freighter passing below. It was just like the imaginary one from the aqueduct. The zoom lens brought her name into focus: the Algoma Equinox, a freighter with her very own Wikipedia page. It is good to know that a laker can be famous without suffering the fate of the Edmund Fitzgerald. A hand-off from Selfridge ANGB to Detroit Approach always marks the home stretch. From 25+ miles east, I had the parallel runways at Oakland County International in sight. We landed and successfully navigated the re-jiggered taxiways to Michigan Aviation. Even Ground Control stumbled when using the new taxiway names. A lineman at Michigan Aviation explained that the project was enough of a disaster that the taxiway names were likely to change again. Having significantly recovered from her surgery, Mom is driving again, able to walk farther, and eating substantial meals again. The Bear popped open the Warrior's door to find Mom waiting there on the ramp at the trailing edge of the wing for us. They were delighted to see each other. We stopped for lunch at Parker's Hilltop Brewery and Spirits, a relatively new pub on Waterford Hill with great beer (that I could not sample because of the return flight that afternoon) and great food (that I sampled with relish). Coincidentally, this new establishment in my home town is owned by the brother in-law of a colleague in Rochester, NY. What are the odds? Deeming it something of a special lunch, I allowed The Bear to do something she had never done before: she ordered a pop with her meal. Just as mine did at her age, her tastes skew toward orange. We had a great visit with Mom. We walked! We talked! We played Exploding Kittens! Today was about the enjoyment of crisp fall air, the flutter of colorful leaves falling earthward, and three generations spending time together. We enjoyed the calm before the storm. Mom starts a new treatment regimen soon and no one knows how it will affect her. The Bear was very proud to be in charge of Dougal as we strolled through downtown Clarkston, but I think Dougal was the one actually running the show. I still feel disoriented when in town; the same buildings are there, but with the notable exception of Rudy's grocery store, everything else is changed and unfamiliar. After lots of hugs for Mom, we departed at 4:00 that afternoon. A tailwind aided our race back to New York before sunset. At one point, I looked down from our 1.5 mile high altitude to see definitive evidence that we were still in the vicinity of metropolitan Detroit. For my friends in Rochester, NY, I want to point out that the Red Wings are a hockey team. Partway across Ontario, I became curious and removed the cover on the attitude indicator (AI). It is still covered and placarded as "inop" since the failure in September. Installation of an electronic replacement AI has been pushed back to the first week of December, which effectively ends my IFR flying for 2017. "Daddy, that's creeping me out. Cover it back up," instructed my copilot. Yes ma'am. We returned home at 7:00 pm, exactly twelve hours after we departed. It was an exhausting day, but a very worthwhile one. The Bear and I helped Mom the only way we could, by giving our time. Thankfully, it was all made possible by our wonderful blue and white time machine. Something in the Water at ZBW? Transitioning eastward out of Albany's airspace, I switched frequencies for the next sector. "Boston Center, Warrior Two One Four Eight One, seven thousand five hundred." After a pause, my missive was answered in a businesslike tone with the typical response of a controller distracted by other duties during an initial contact. "Calling Boston, say again." I repeated the call and received an unusually enthusiastic response beamed back at my ship from a radar room somewhere in Nashua, New Hampshire. "Warrior Two One Four Eight One! You picked a beautiful day to fly to Block Island! Radar contact, Bradley altimeter three zero zero six!" His delivery could almost be described as Neganesque with all the enthusiasm that entails, but fortunately none of the pathological narcissism. If that's not validation for my choice of destination, I don't know what is. Fall is my favorite time of year to fly. Weather permitting, I usually take a vacation day in early October to fly somewhere and enjoy the fall color. More often than not, I go to the Adirondacks. This year, a shroud of mist and clouds was forecast to hide the mountains of northeast New York. As I pondered alternative destinations, I remembered that I had an unaccomplished secondary goal for 2017 of landing in a new state. Most of the nearby states have already been sampled except for Rhode Island and Delaware and, honestly, web searches did not reveal much that interested me in Delaware. Rhode Island, however, has Block Island. Standing in the Atlantic Ocean about 10 nautical miles off the Rhode Island coast, Block Island is part of an archipelago formed by the terminal moraine of a glacier that once covered portions of North America. Cape Cod, Nantucket, Martha's Vineyard, Block Island, and Long Island are all land features created from the moraine and are collectively known as the Outer Lands. The forecast for the eastern seaboard was excellent and so I settled on Block Island as my fall flying destination. That morning, I stood on the ramp of the Williamson Sodus Airport looking up at low scud hanging over the field. I was trapped. Isn't this the reason I earned my instrument rating? It was, but the Warrior was not equipped, still lacking a reliable attitude indicator. The Garmin G5 replacement instrument is back ordered another few weeks. However, it was a dynamic ceiling, alternately presenting gaps showing swaths of blue sky, then closing in. Toward Lake Ontario to the north, the sky was completely clear. By the time I finished refueling the Warrior, there was a large hole immediately west of the airport in addition to clear sky on the north side. I launched in marginal VFR conditions and climbed above the loose patchwork of clouds hanging over the field. Not only was there an outstanding forecast for the Connecticut / Rhode Island shore, but the Stratus 2 fed updated weather reports to my iPad throughout the trip showing the eastern seaboard to be clear of clouds. By way of ADS-B, I can "see" weather conditions much farther ahead than in the past when in-flight weather gathering was limited to radio reception of distant automated weather observation systems. Though I was above an overcast for much of the flight over New York, I had few concerns about being trapped above the deck. At 7500 feet, the Warrior reached ground speeds as high as 152 knots (175 miles per hour), making for an expeditious trip east. The winds aloft were forecast to relent over the course of the day such that I would not pay much penalty for my enjoyment of the tailwind that morning. Such two-way wins are rare and the timing was fortuitous. I remained above the ceiling until reaching the Hudson River. There, I found the entire river valley clearing. The Catskill Mountains lay beneath the dissipating clouds along the west edge of the Hudson River valley. It was here that I saw my first widespread fall colors of the season. Foliage color varied with elevation, green to yellow to red, much like terrain hazard warnings in many aviation GPS units. As I approached the eastern edge of New York state, I could look across the breadth of Connecticut and Rhode Island to where the morning sun reflected dazzlingly off of the Atlantic Ocean. With the ocean in sight, Albany Approach handed me off to Boston Center for enthusiastic affirmation of my plan for the day. 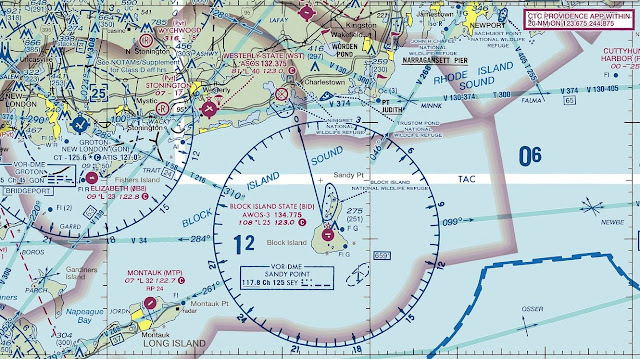 Rather than fly direct to Block Island, my route took me through LAFAY intersection due north of the former Charlestown Naval Auxiliary Air Station. A direct flight to Block Island from LAFAY would minimize the distance flown over Block Island Sound to a mere ten nautical miles. I was saddened by the sight of the dead and decaying airport below, the former Charlestown NAAS. During World War II, the field was a training hub for night fighter Hellcats equipped with ungainly radar pods beneath their right wings. The base was closed in 1974. From the air, Block Island appears to consist of two geologically distinct regions; an eastern rocky portion probably remaining from the original moraine and a sandy extremity on the leeward side of the island that reaches back toward the continent like the tail of a comet. Stick-like shadows showing against the glare of the morning sun betrayed the positions of wind turbines set directly in the ocean off the eastern shore of the island. Descending over Block Island Sound, I flew a wide, arcing path that positioned me for a 45° pattern entry to the left downwind for runway 28. Block Island State Airport sits on what appears to be the highest point of the island (108 feet above sea level). It features a single runway with an unusual aspect ratio measuring 2502 feet long and 100 feet wide. The unusual width for a runway so short makes the runway appear even shorter than it actually is. The topography and taxiway layout suggest that land east of the airport was built up to extend the runway at some point in the past. The town of New Shoreham is arranged around the Old Harbor. Block Island can only be reached by aircraft or ferry. A ferry was docked in Old Harbor when I arrived. New Harbor was created when the Great Salty Pond in the middle of the island was dredged to create a channel to the Atlantic. Thanks to the tailwind, I landed at Block Island State Airport a mere two hours after climbing away from the scud over home. I exited the runway at the midfield taxiway and parked next to a V-tailed Bonanza as directed. A couple of years ago, the airport authority significantly raised landing fees on Block Island, resulting in enough backlash from the pilot community that the airport authority backed down. Today I paid the compromise $10 landing fee, which seemed reasonable considering that I would have paid more for a one-way ferry ticket from the mainland. Although several web resources made it appear as though bike rentals were available through the Block Island Tourism Council office located at the airport, this was not the case. I needed to either walk the mile into town or take a taxi (a taxi ride from the airport to Island Moped and Bike is free) to reach bike rentals. Hungry, I decided to have a late morning second breakfast (western omelet, yum!) at Bethany's Airport Diner, sitting outside at a shaded table adjacent to the airport ramp. My second breakfast was excellent and provided necessary fuel for what was an active day. As I finished eating, I stuck up a conversation with another Cherokee pilot named Ray who accompanied me into town as far as Island Moped and Bike. We parted company there and I continued my tour of the island alone. The bike rental was $15 for the day with lock included. This was the (t)rusty steed that allowed me to explore the entire seven mile length of Block Island like a BOSS. First lit in February of 1875, the Southeast Lighthouse stands atop the impressive Mohegan bluffs that form the island's eastern edge. In 1993, erosion of the nearby cliff necessitated moving the entire structure a few hundred feet farther inland. Tours are available in-season, but not the day I visited. In the mid-16th century, the Mohegans tried to conquer Block Island. They failed spectacularly and were forced over the bluffs to their doom by resident Niantic. Centuries later, the bluffs still carry the Mohegan name. A steep wooden stair takes visitors most of the way down to the base of the cliff. I considered taking a rock home for The Bear, budding rock hound that she is, but decided against it. Though it was not the same as plucking a flower in a wilderness preserve, I also did not want to carry a rock around with me for the rest of the day. The climb back up the stairs was not nearly as strenuous as other people made it appear. Then again, I had to wonder about the person who paused partway up for a smoke break. That struck me as a little self-defeating. I saddled up and proceeded inland away from the bluffs. Perhaps that explains the saddle sores I had the next day. HERE ORIGINAL SETTLERS LIVED IN CAVES AND SHELTERS..."
From the Fresh Pond, I rode north, briefly stopping at the airport for water, then continuing on to Sandy Point and the North Lighthouse. The road ends approximately a mile prior to the lighthouse and I traveled the rest of the distance on foot through the dunes. At first, I mistook the structure of the North Lighthouse for weathered wood. On closer inspection, the 1867 structure was actually crafted from brown granite. Its isolation on Sandy Point made the North Lighthouse seem a lonelier place than the Southeast Light. I thoroughly enjoyed the sights on Block Island and look forward to sharing them with my family someday. I wished that I had more time to loiter, but after four hours on the island, I knew that I would be chasing the sun home. The journey back to New Shoreham from Sandy Point was a slog. The bike had functional gears, but the sprockets were rusty and the chain poorly aligned such that it rubbed on the derailleur in the lower gears. As I puffed my way up a couple of hills, I developed a deep seated regret for my choice of transportation every time a moped zipped past me. I returned my bike in town and drank a lot of water to re-hydrate. Note to self: bringing a water bottle on a trip is only useful if it is not left in the airplane. On departure, I gained altitude near the island before crossing the sound. Every time I read the words "Block Island Sound" on the sectional chart, Billy Joel's "Downeaster Alexa" would start playing in my head. Days later, it was still stuck there. Curse you, Billy Joel, for your catchy, pop-rock sensibility. Although the winds aloft had diminished, they did not slow as much as originally forecast. From Block Island to Albany, best ground speeds were in the range of 95 to 100 knots. I used ForeFlight's fuel price tool to find $4.19/gal avgas at South Albany Airport (4B0) in South Bethlehem, NY. A fuel stop was necessary because Block Island does not have fuel available. South Albany was an unfamiliar airport and the only things that I knew about it were that it was small and that there was inexpensive self-service fuel to be had there. Landing on runway 1 at South Albany, I passed directly over a large train yard on final approach. Cars were actively being coupled together as I crossed overhead and I wished that I could hover there on short final to watch. Alas, the tyranny of gravity. South Albany Airport was a pleasant surprise. I expected a small, quiet field with a weathered shack of a terminal building and a battered, but wholly adequate, self service fueling system. What I found instead was a fastidiously maintained gem of an airport. Everything at the airport was in excellent condition and clearly maintained by a group of people who took great pride in their facility. I felt right at home immediately and, though I did not meet anyone while I was there, I could not help but think, I like these people. As darkness mounted, I ran up the engine in the shadow of my own greatness (apparently - just look at those wheels). As I departed, someone from the airport radioed to ask if I had left a jacket in their pilot lounge. "No, but thank you for asking!" I responded before flipping over to Albany Approach. See? I knew I liked these people. For once, I caught a break flying westward at dusk; my 300° heading placed the setting sun behind the pillar at the edge of my windscreen. Reality finally caught up with forecast and the wind aloft now allowed a 105 knot ground speed that crept up to 110 knots for the last half of the flight home. As natural light dwindled from the sky, the streets and buildings of Syracuse lit the world from below. A memorable autumn day trip ended in the glow of runway lights at the Williamson Sodus Airport. I was home again, after an adventure in a beautiful place, a landing in a new state, the addition of two new airports to the map (for a total of 184), and my first night landing since June.